We’d love your help. 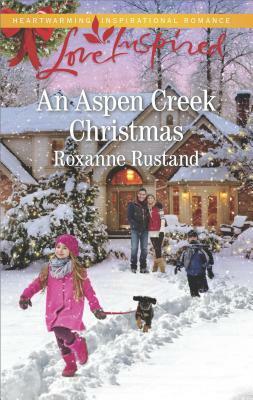 Let us know what’s wrong with this preview of An Aspen Creek Christmas by Roxanne Rustand. All Hannah Dorchester wants is to give her orphaned niece and nephew a happy Christmas. She's ready for anythingexcept their uncle Ethan Williams. Thirteen years ago she was planning their wedding and he was planning his escapejoining the military without even a goodbye. Ethan never meant to break Hannah's heart, but now the recovering soldier's back and he wants his late brother's kids. He's got one month to prove he'll be the better parent. But as they start sharing in the joys of the season, he's determined to show Hannah he's also become a better man. Could this be their final chance at familyand their second chance for love? To ask other readers questions about An Aspen Creek Christmas, please sign up. A nice Christmasy little tale that has everything I look for in my favorite Hallmark Christmas movies...snow, community, kids, pets, decorations...and a healthy little spice of romance. It was pleasant, also, to have the hero a veteran with war wounds to overcome. Fourth in the Aspen Creek Crossroads inspirational romance series and revolving around two orphaned children whose aunt and uncle are battling for custody. Set in northern Wisconsin. It's easy to see how this sweet, cozy story will end; the fun is in following the path for its details. Details that include a homey little village where everyone knows everyone else, and cares about each other; the care and concerns Ethan and Hannah take over the children in giving them confidence, boosting t Fourth in the Aspen Creek Crossroads inspirational romance series and revolving around two orphaned children whose aunt and uncle are battling for custody. Set in northern Wisconsin. It's a rough time for Hannah, Molly, and Cole, as they all try to come to terms with the loss of Molly and Cole's parents. It's the grief, starting over at a new school, the dramas of childhood, dealing with night terrors, making new friends, and the memories of holidays past. Rustand complicates things with Hannah and Ethan having had a painful past along with both of them making snap judgements and both having reservations about the other. I am confused about Ethan's thought processes. He thinks he lost something precious in the past (and screwed up in his closer past), but then he also believes that Hannah's a flake. Huh? I'm also curious as to how Ethan thinks he can handle two kids without any experience or any support system? "I threw away something I knew I'd never find again." Ooh, mama! That Hannah gets in some nice zingers! The one that sticks out is when she says she was made a laughingstock, but she figures she was saved from a lifetime of living with her worst fears, although it does get monotonous with Hannah and Ethan going over and over (with each other and in their own thoughts) about how awful everything is/was, so it is with some relief that I got to the end in that respect. That Great-aunt Cynthia is a pip…a rotten one, and I gotta wonder about her reasoning. Rustand did a great job of slowly bringing the children out of their shells. And I loved how caring and patient both Hannah and Ethan are. It's enough to make you hug yourself with happiness! It's a bitter custody battle for the children, and Hannah is determined to keep them, to give them a welcoming, loving home, to grant them a sense of permanency. It's no surprise that Hannah feels she has a good chance of having the children, for their uncle still hasn't come home to see the kids. Not in the seven months since his brother and his wife were killed. But how can Hannah compete with the wealthy Great-aunt Cynthia bearing down with her lawyers? Hannah Dorchester, the children's godmother, is a physician's assistant at the Aspen Creek Clinic and runs a volunteer animal rescue. Some of her rescue animals include Maisie, a retriever; Bootsie is the basset hound; Eenie, Meanie, and Moe are the kittens; Penelope is the Shetland pony; Mabel, Ruth, and Louise are the chickens; and, Belle is the dog Molly helps rescue. Eleven-year-old Molly and six-year-old Cole are still reeling from their parents' death and their time spent with Great-aunt Cynthia. Dee and Rob Williams were their parents. I think Dee was Hannah's sister?? Uncle Ethan Williams was Rob's brother, Cynthia's nephew, the children's godfather, and a soldier. Janet is his ex-wife. David Benson, an ex-Marine, is a high school acquaintance now running a security business in Dallas. Tommy Joe is another soldier. God knows why Great-aunt Cynthia, a wealthy widow, in Dallas, Texas, is so determined to keep the kids who were orphaned seven months ago in Texas. Some of Hannah's friends include Keeley North, who owns an antique shop (her fiancé, Connor Rafferty, is a former rodeo star; The Single Dad's Redemption , 3); Sophie McLaren who has a son, Eli, while Dr. Josh McLaren who works at the hospital is her husband ( Second Chance Dad , 2); Beth Stone (she runs the bookstore, and her husband, Devlin, who was also in the army; Winter Reunion , 1); and, Olivia Lawson who is in the local book club. Faith and her cousin Joanie will be fellow students. Teachers include the tough Mrs. Stone for math, the nice Mrs Fisher for English, Miss Hayward, Mr. Coe, and Mrs. Belkin. Pete drives the sleigh drawn by Frank and Earl. Bill Jacobs is the fire chief; Marnie is his wife. Gladys Rexworth is another wealthy woman who knows how to hold a grudge. Margaret (she has a son, Trevor) has some good advice about skates. Dr. Darcy Leighton is a veterinarian; KayCee helps out; Marilyn is the receptionist. Ann is a nurse at the ER. Georgie "Liz" Anderson is the social worker who will assess how Molly and Cole are doing. Fred Larsen inspects animal rescue shelters. Pastor Mark leads the local church. …where Hannah works. Connie is the receptionist. Dr. Talbot is one of the doctors. The now-retired Dr. Martin was a weak man. The cover is so warm and cozy…even if it is set outside in a snowy twilit front yard. It's the kind of house you want to come home to with its multiple roofs, a bay window, and snow-covered evergreens with those bare trees in the back silhouetted against the lilac sky. The lights are on, welcoming you in, with Ethan and Hannah comfortably close, Cole going after Molly who has the puppy's leash. The publisher's name is at the top in a deep coral script, dancing across a yellow banner proclaiming the genre. The title and author's name is below it, across the top of the house, in white. This was a really sweet book. I really loved the way the aunt dropped everything to take in her niece and nephew. I was really impressed with how she handled everything. I also really liked their uncle too and was impressed with how good he was with kids when he literally had no experience. I just felt like the story was moving along at a really nice steady pace and then BOOM it skipped to the ending with no transition whatsoever. It was like it skipped three chapters worth of progress in the sto This was a really sweet book. I really loved the way the aunt dropped everything to take in her niece and nephew. I was really impressed with how she handled everything. I also really liked their uncle too and was impressed with how good he was with kids when he literally had no experience. I just felt like the story was moving along at a really nice steady pace and then BOOM it skipped to the ending with no transition whatsoever. It was like it skipped three chapters worth of progress in the story. I still got the ending I wanted but it was so sudden that I didn't enjoy it like I wanted to. I know these books are going to be short but I still want the substance of a well thought out plot and felt cheated by the skipped parts in this one. A delicate tale with deep emotions, ranging from utter despair with the loss of the parents and siblings, to the turbulent memories of broken hearts and promises, to the joy of Christmas, puppies, and playing in the snow and the angst of starting a new life, school, and all that it entailed. My heart broke for Molly and Cole, the children whose life was upside down with the death of their parents, once again relocating and trying to find their footing in the new environment. Hannah was doing her A delicate tale with deep emotions, ranging from utter despair with the loss of the parents and siblings, to the turbulent memories of broken hearts and promises, to the joy of Christmas, puppies, and playing in the snow and the angst of starting a new life, school, and all that it entailed. Hannah was doing her best, and that was a lot, the kids were lucky to have her, even if they couldn't understand it at the moment. Ethan was a surprise that no one expected, yet he was determined to get his time with the kids, and finally get the chance to know them, and possibly be their guardian if he had anything to say about it. Hannah has just received legal custody of her orphaned niece and nephew. She wants them to have a wonderful Christmas and is looking forward to reconnecting with her late sister's children. But she isn't prepared for their uncle Ethan who asked her to marry him thirteen years ago and then promptly disappeared. Hannah is living in fear that he'll take the children from her and she'll once again be standing there heartbroken. But Ethan has changed. If he can convince Hannah of this fact, they jus Hannah has just received legal custody of her orphaned niece and nephew. She wants them to have a wonderful Christmas and is looking forward to reconnecting with her late sister's children. But she isn't prepared for their uncle Ethan who asked her to marry him thirteen years ago and then promptly disappeared. Hannah is living in fear that he'll take the children from her and she'll once again be standing there heartbroken. But Ethan has changed. If he can convince Hannah of this fact, they just might be able to work things out. This was a very cute read for the holidays. I found myself wishing I was at Aspen Creek for the holidays. This is the story of Hannah and Ethan who used to be engaged but Ethan kind of messed it up and left Hannah at the altar. She kind of had a hard time because she truly felt something for him. Then her sister dies in a car accident and she has to take custody of the kids...which Ethan also wants. Will he succeed? Will they be able to overcome whatever it is they're feeling? I really enjoyed this book. When I first started reading it I thought it was going to be full of animosity between the 2. It was not. I really liked how Ethan Grew to respect Hannah. I would recommend this title to everyone. It is a quick simple read. A beautiful tale about how family isn't just the make up of DNA. To be a family you have to have happiness, trust, and love. It was a good old fashion love story and I would recommend you read it.